Hey, Myrtle, how you doing? Oh, I been doing good, but you wouldn’t believe the kind of week I’ve had. You just never know from one day to the next, do you? You just never know. But I tell you, I finally got me some Grandfather’s Beard, would you believe it? It’s going to go real good in my back corner, next to Zelma’s fence, you know? Good shade and all, it should do real good. Where’d I get it? Well, that’s a mite longish story, Myrtle, you sure you got time? Okay, here goes. You know about my trips over to Timmonsville, to feed Dilly’s persnickety cats of a morning, I told you all that. It’s only a matter of eight miles, after all, and since I did persuade her to sign up for that Branson trip, and since her other friend Belle decided at the last possible minute to go along, well that obviously left nobody to look after those kitties ‘cepting me, naturally. Well, that old house back in the field right where the angled-up road hits 76, used to be an old feed store there, you remember that place? The Grandfather’s Beard was in full bloom in that yard, all smothered up in knee-high weeds, looking like it was gonna strangle to death, and nobody living there. I drove past it pretty fast that first morning, just barely glanced it was all. Figured it belonged to somebody, don’t you know. But that afternoon I eyed over that way a little better, and lo and behold if I didn’t spot a purple Althea up against that old front porch, just bending over with branches loaded down with flowers and buds and all. No, I don’t remember Althea Goodbody, Myrtle, pay attention. Anyhow, I was past it before I could look any more, what with the traffic coming and the road angling and the school buses and all. The next morning I drove a mite slower past there, and took note of the yard a bit better. No, it didn’t have Centipede, Myrtle, it had weeds didn’t I tell you. Do country folks plant Centipede anyway? Stay on the point. 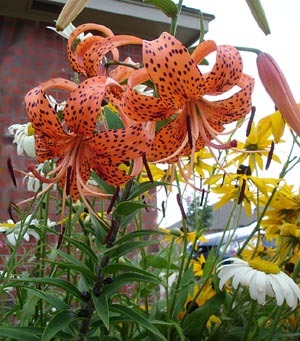 Well, I knew about the Grandfather’s Beard and the Althea, but this time the Tiger Lily practically just up and bit me! No, Myrtle, there wasn’t no real tiger, it’s a flower, they just call it Tiger Lily. It’s a lily what looks like spotted tiger fur. There was two of them things growing in a bed right next to the front steps, I don’t know how they survived all them sandspurs. Well, of course I knew they was sandspurs, Myrtle, I felt ’em, didn’t I? Oh, yeah, I guess I done left out that part, about driving up in the yard. Well, I mean, lordy me, nobody was looking after those poor old plants. The driveway wasn’t in too bad shape but that yard was something else. Anyhow, that was the second day, wasn’t it? Yeah, that’s right. I wasn’t dressed any too sturdy for sandspurs, so I just went on home. Well, that next morning I left home a mite earlier. Those kitties were tended to good and proper by 7:00 AM, let me tell you, and this time I had the good sense to wear brogans. Brogans, Myrtle. Don’t you know what brogans are? Boots used to wear up in the chicken yard back home before we bought that city house. Course they still fit, you think I’d of been wearing them on my feet if they didn’t fit? Now, there was still some traffic out on 76, so I figured if I wanted a little privacy to investigate this abandoned house where nobody was looking after them perfectly good plants, I’d better pull the car around back. There was this big old falling-down barn back there and the driveway went all the way up to it, like they probably had farm trucks and hay wagons and such, and the doors standing more or less open. Well, probably more less than more more, but I managed anyway. No, there wasn’t any garage or carport, Myrtle. This was a farm house, not a city house, ain’t you listening? The car fit in okay, I didn’t go in all that far, wasn’t sure but what they might have nails and such in the ground and it was pretty dark in there. Anyhow, I didn’t plan on being there all that long, was I? The back of the house had a little half porch stuck on it, with a window into what I figured was the kitchen. No use coming this close and not peeking in, was there? No, I didn’t turn on any light switches to see better, Myrtle. You think the electric would still be running to a broken down old house surrounded by weeds and overgrown bushes and volunteer trees and sandspurs and covered in cobwebs? Cobwebs. Spider webs, don’t you know what a cobweb is? With my gardening gloves and my snippers, of course. Look Myrtle, if you don’t want to hear the rest of this I can hush up right now. Okay. Well, I wasn’t too certain of them steps, but I made it to the porch finally, and tried to make out something about the kitchen through that window. Yes, the panes were still in it, that was sort of a miracle right there. No, the window wasn’t fastened, but no I didn’t climb in the window. Because the back door wasn’t proper locked, Myrtle, it would open. It only needed a couple of good shoves and one little kick. At the lock plate. It was warped, that’s why. That kitchen had a table still in it, and two chairs and a trash burner stove, rusty stove pipe and all. No running water, though. Just an old rusted over metal sink. The house had five actual rooms in it, if you count the kitchen which was a little bitty room, really. Nothing in the way of real furniture in the rest of the place, just a bunch of old cracked linoleum rolled up, and some fat literd kindlin’ and some rusty fence wire, and a broken down bedspring without any bed. Looked like they used to use the place to store stuff in, maybe. So I figured nobody had lived there in quite a spell, which meant to me they had done abandoned the place. Stands to reason. What does it matter? Myrtle, of course it matters, if it’s abandoned, then the plants and flowers was abandoned, wasn’t they? Fair game for a body if they’s abandoned, right? By then it was up in the morning and the buses was going by pretty regular, so I waited a bit till that all died down some before getting my car out and going on back home. I calculated the best time to do some digging might be after dark, even if it is abandoned, no use in raising questions in some snoopy body’s mind, is there. I’m getting to that, just hold your horses. Thursday evening — let’s see, that would be three days ago now, wouldn’t it — yes, that’s right, it was Thursday evening, around 11:30. No moon, it had done come up and gone down, no light along there, so I took my heavy duty flash. The one I use when the electricity goes down in a storm, the one you can set on the counter like a lamp? That’s the one. Figured it would set on the ground steady enough, and all them weeds would hide the light from any snoopy bodies that might be driving by that time of a night. No, I don’t recollect what I paid for it, had it five or six years, don’t you have one of them? You ought to get one, Myrtle, comes in real handy in them autumn storms like we got. Can I get back to telling the story, please? Well, of course I put the car back in the barn, Myrtle. No use in being too awful obvious, even if it was behind the old house and it was a dark night and all. Better safe than sorry, that’s what I always say. And naturally I had my shovel in the trunk. No, not usually, Myrtle, but after all, I never had a Grandfather’s Beard in my yard before, and I had to come prepared, didn’t I? Pays to be prepared, I always say. So I’m being careful where I step getting out to that Grandfather’s Beard, Brogans or no Brogans, might be broken glass in them knee-high weeds for all I know, when I passed close by that Tiger Lily. Now you know, in for a penny, in for a pound, Myrtle. Them lily bulbs can be delicate, but if this one had sprouted in the midst of all that neglect, why it would probably take right to transplanting with a little extra love and kindness, I figured. Well you’d of figured the same, Myrtle, really. Yes you would’ve! Anyhow, I took a few extra minutes and dug around them bulbs good and proper and lifted them right out of that overgrown flower bed into my paper sack with enough good dirt in there to keep them okay till we could get home. I left the sack there on the path and continued on to that Grandfather’s Beard bush, trying to figure how many cuttings it would take to get a good root, you know. No point in risking failure, is there. Next step was the Althea bush, but it had lots of little baby sprouts round the base like they do so it only took a few shovels to get five good sprouts. No, they wasn’t blooming, but they will, one of these days they’ll have big purple blooms just like their mama. Well, no, that’s not everything, exactly. I figured since I was there, and I had a good light, and you can’t see it from the road anyway, and besides, who’s likely to notice at midnight on a Thursday, I’d just have me a look-see in that barn. Um, um, um. Who’d of thunk it in a million years, Myrtle, not me. Um, um, um! The reward is $400.00, Myrtle. I can shop till I drop at the Lowe’s, get me a whole bunch of brand new bulbs to go around the base of Grandfather’s Beard and maybe a few Irises to bed out Tiger Lily. They call it a bust, is what they call it, Myrtle, and they didn’t let me watch ’em do it, and they wasn’t too happy that I’d interrupted their stake-out, but how was I to know it was a marijuana farm? Looked abandoned to me, and would have to any innocent, law-abiding soul, that’s what I say. They heard me screaming bloody murder, that’s how. That light hit them flat boxes full of little bitty green plants, looked kind of like poison ivy but why on earth anybody in their right mind would grow poison ivy in a box on purpose was beyond me, and then what with the “Who the hell are you?” in my ear, well, any old lady would have screamed her head off, wouldn’t they? Course they would! No, the law didn’t arrest me. They knew I wasn’t in on it, they’d been watching me flit back and forth around that place all week. From the woods over by the next field. Why’d they give me the reward? Well, really, Myrtle, that is a trip. So’s I won’t go messing in any more of their business, that’s what I had to promise ’em, so I could go and buy me whatever kind of flower and bush I want, and leave off visiting any more abandoned farm houses. Well, yeah, they let me keep ’em, Grandfather’s Beard and Tiger Lily and Althea too. They’re prospering like you wouldn’t believe, Myrtle. The kitties? Oh, they’re good. Fat and sassy. No, I didn’t mention any of this to Dilly, you know how she is. Too snoopy for her own good. Wouldn’t want her to get the wrong idea, now would I. But you never know, Myrtle, you just never know. I surely had me a week!